Ryan Lovelace is the creator and purveyor of some truly mind bending surf craft, shapes and designs that alter their riders approach and the lines they draw on the face of a wave. Residing in Santa Barbara, California, Lovelace has been shaping some of the most thought provoking and stoke invoking boards of the past decade. He seems to blend elements of past, present and future; creating unique boards for surfers who seek an alternative to the almost robotic approach conventional surfboards oftentimes lend themselves to. Simply stated, he’s one of the most prolific and creative shapers out there today. If you are looking to pick up a board that will change your perspective on what surfing can be, well this is your lucky week. 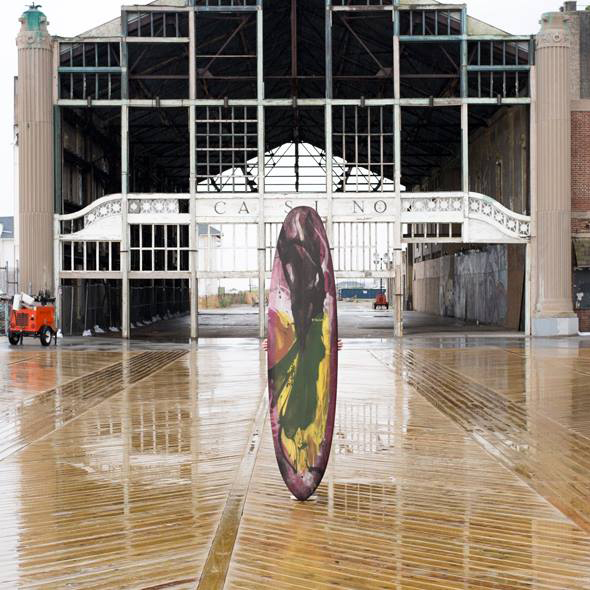 Lovelace will be coming to Asbury Park, specifically to the recently opened Glide Surf Co. on Bangs Avenue; shaping custom boards and spreading the stoke of his fresh take on surfboard design. 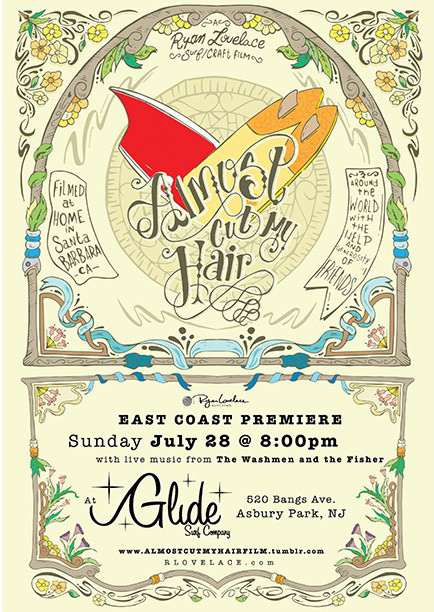 He will also be in town to help promote the premiere of his newly released surf film “Almost Cut My Hair”, which will be screened this upcoming Sunday, July 28th at 8PM at Glide Surf Co. You can also see Lovelace in the Asbury Anchor and Two Moto Co. sponsored motorcycle helmet art show High Seas, Open Roads which happens on Saturday, September 7th at Asbury Park Yacht Club. Lovelace, who’s also a motorcycle enthusiast, will incorporate some his surfboard aesthetic into a helmet for the show. I reached out to Ryan to ask him a few questions about surfing, shaping and his overall approach to both. ZAPPO: What initially drew you to the ocean and surfing? LOVELACE: I’m not entirely sure, I grew up in Seattle with stories of surfing from my family, and then it was dangled in front of my face every summer when we’d go visit my grandparents in Maui. I was a full-time skier who had surfing plastered all over his walls and a Hobie egg across my bedroom floor. There are endless amounts of water around Seattle and I think seeing all that flat water made my desire grow stronger and deeper to be near waves that I could ride. ZAPPO: Tell us a bit about your early years riding waves and what memories you have from that period of your life? LOVELACE: I remember mostly how few and far between they were, ha! I do remember being pushed into waves in Maui, and one wave that I caught with my brother and my dad that we all rode together – I think it was the first time my eyes really opened to how wonderful surfing was; watching the reef go by under my feet and having those two stoking out on either side of me kind of sent me over the top. 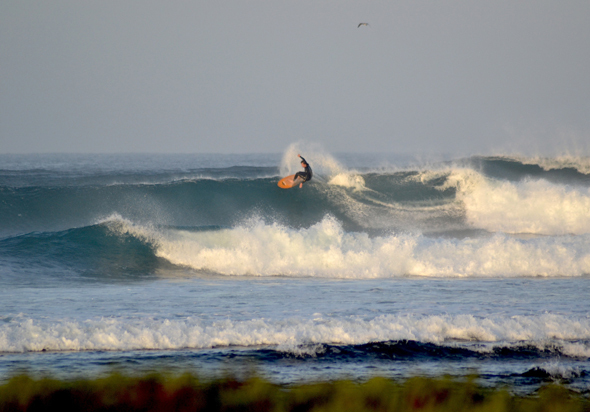 ZAPPO: When would you say you became a dedicated enthusiast of surfing as a lifelong pursuit? LOVELACE: I think that happened before I can remember honestly, I can’t really think of a time in my life where I didn’t want surfing as a central point in my life more than almost anything in the world. ZAPPO: When did you start shaping and what was the impetus for you to tread the path of the craft? LOVELACE: I started shaping a bit out of necessity. I was in my first year of college in Santa Barbara and finally having surfing around me was everything I could have hoped for. I started lusting after different board designs pretty much right away and once I found out I could make my own board instead of buying a new one it just spread like wildfire all over my life; everything became engulfed in surfboards from the second I woke up till bed time. That was 8 years ago now and its honestly no different at this point, ha! ZAPPO: These days many people are riding what would be considered “alternative” surf craft, boards that are outside the realm of the standard high performance thruster design. Why do you think people are being drawn to this type of equipment and why do enjoy creating such equipment? LOVELACE: I think any time you stagnate a culture it’s going to have a backlash of some type, not a backlash in a violent sense; but an emergence of new ideas and desires. I enjoy making them because that’s what I surf and that only makes sense to me! ZAPPO: What are your favorite types of boards to shape? 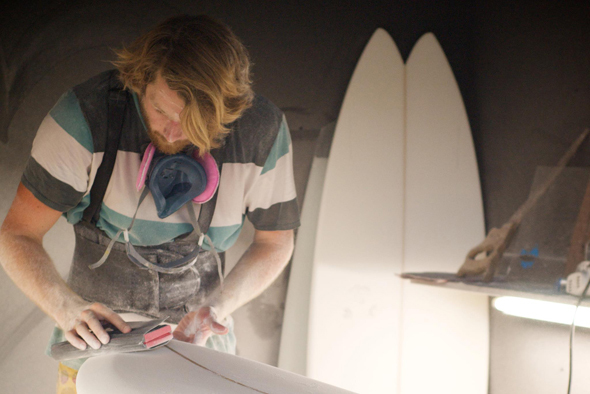 Have you been experimenting with anything that is new to you in the realm of surfboard design? LOVELACE: This is always a difficult question for me; I can’t play favorites because I get so excited about all different types of surfboards. They each have such interesting theories and goals around them; it’s always a process creating one to hit the different points that you want it to. I’ve been shaping a fair amount of finless boards recently and that’s got me the most excited. It’s such a new realm, the lines are fresh and there are no rules as to what I can and can’t do to make them work. ZAPPO: You’ll be here in New Jersey the week of July 22nd. What is the purpose of your trip to NJ? 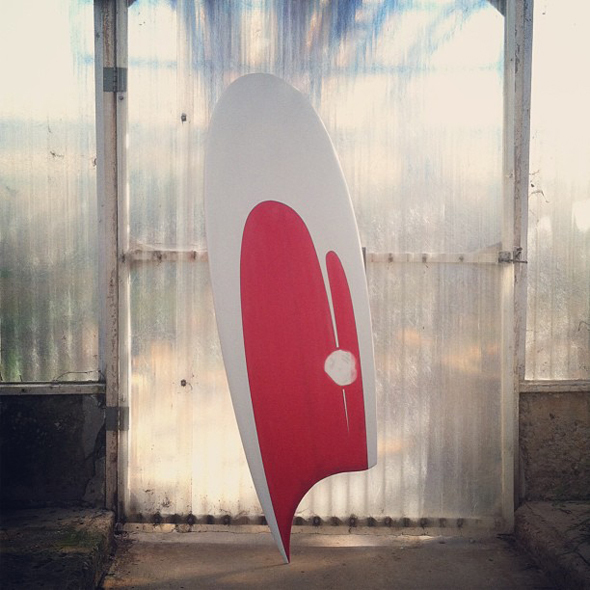 LOVELACE: I come out to shape boards for customers through and for Glide Surf Co. in Asbury Park. This time is a little different though because Phil has just re-opened his shop and I’ve just premiered a surf film that I’ve put together; so we’re going to team up a little and put on a re-opening/premiere party on the 28th of this month. I’ll shape a pile of boards to keep everyone happy also. ZAPPO: You’ve been to New Jersey before. What do you think of the surf culture here and how is it different than that of your current residence of Santa Barbara, CA.? LOVELACE: I’ve been doing these little shaping adventures now for about four years and what I’m slowly learning is that comparing and contrasting surf cultures is totally pointless; we’re all the same. We all just want to surf. We have our own constraints that make it more or less difficult, but we all just want to get after it as much as possible. ZAPPO: Recently you just released a surf film that was a total DIY venture entitled “Almost Cut My Hair.” What was the process in creating the film and what are your aspirations for it? LOVELACE: Originally it was a DIY thing, but that went out the window as soon as all my friends and creative conspirators started giving me footage to work with and songs to try out. It quickly became a product of some of the most fantastic relationships I’ve made through surfing; so when I watch it, all I see are my favorite people – the music, the surfers, the filmers…everything! I honestly just wanted to make something for me and my customers and friends to enjoy, and I guess I made the mistake of telling the internet that I was doing it and the fuse was lit. Now it’s in a pile of film festivals around the world and even just took Best Feature Film at the SAL Film Festival in Portugal! 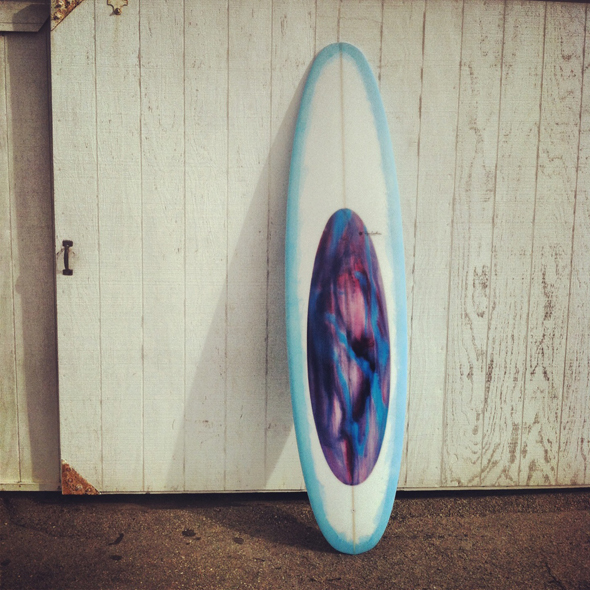 ZAPPO: Who out there is currently inspiring your surfing and shaping endeavors? LOVELACE: Always, my friends in the water. Watching someone surf a board I made is the most inspiring thing in the world! ZAPPO: Any last words of wisdom? LOVELACE: I think I used all the words I know! Yeah actually, do what your heart asks of you, follow it and connect with the people around you. The more open I am to people, the more open the world becomes to me and that’s the most amazing lesson that I’m learning as I go along. Visit rlovelace.com for more info. This entry was posted on Monday, July 22nd, 2013 at 12:02 pm. It is filed under SURF. You can follow any responses to this entry through the RSS 2.0 feed.